By 1940, there was to be another move for the infant model club. 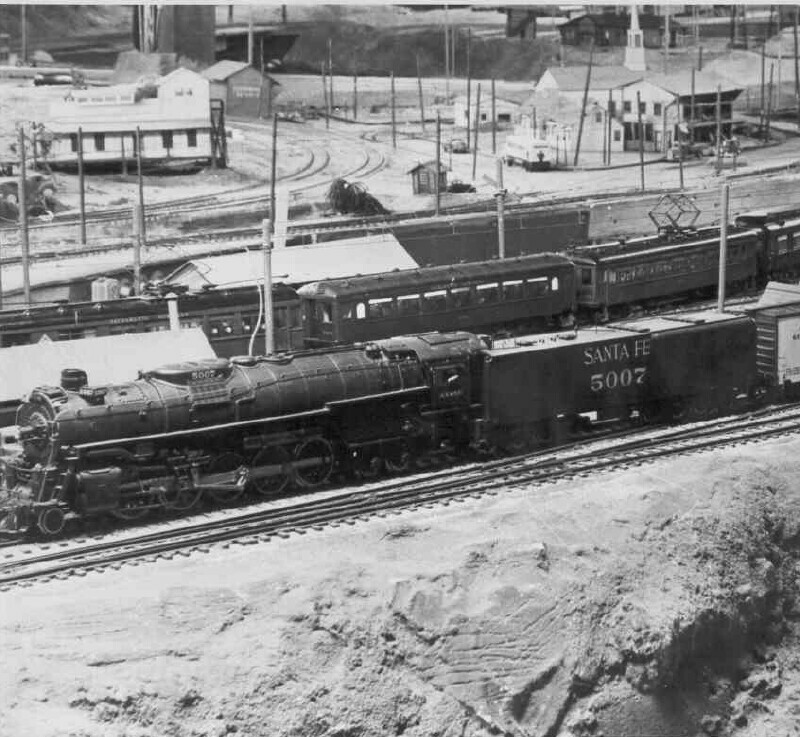 There was a large building in the Oakland/Emeryville industrial area that was owned by the "Santa Fe Railroad". The building was approximately 15,000 square feet in size and was located at the intersection of "Halleck", "Beach" and "Wood Streets". 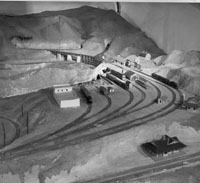 The building was offered to the club by the Santa Fe as a new home in which to build several model railroad layouts, for "top dollar" at the fantastic rate of only ONE DOLLAR per year. 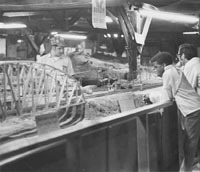 The club accepted the offer and took occupancy of the building in May-1940, a building that was to be its home for the next forty-four years. 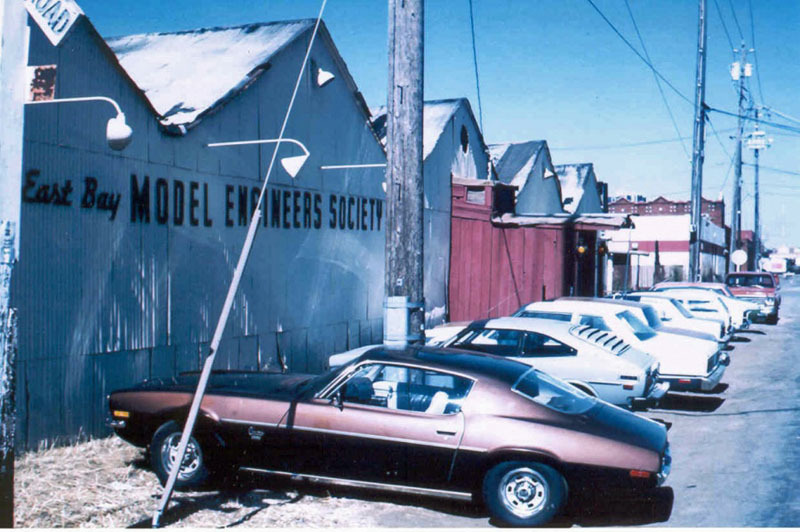 The club's official address was 4075 Halleck Street, Oakland, CA. The building was considered VERY old even when the club moved in. The late "Insley Brain, Sr." (I.J.) 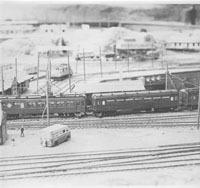 - past President of the Bay Area Electric Railroad Association, Rio Vista Junction, CA - and a long time O-scale traction member of "Eastbay" - stated that the building was used years earlier for the manufacture of "spoke wheels for wagons" . 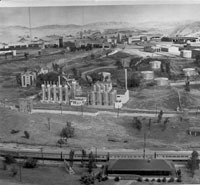 The major portion of the building was within the city limits of Oakland and the "North end" of the building was within the city limits of Emeryville, CA. 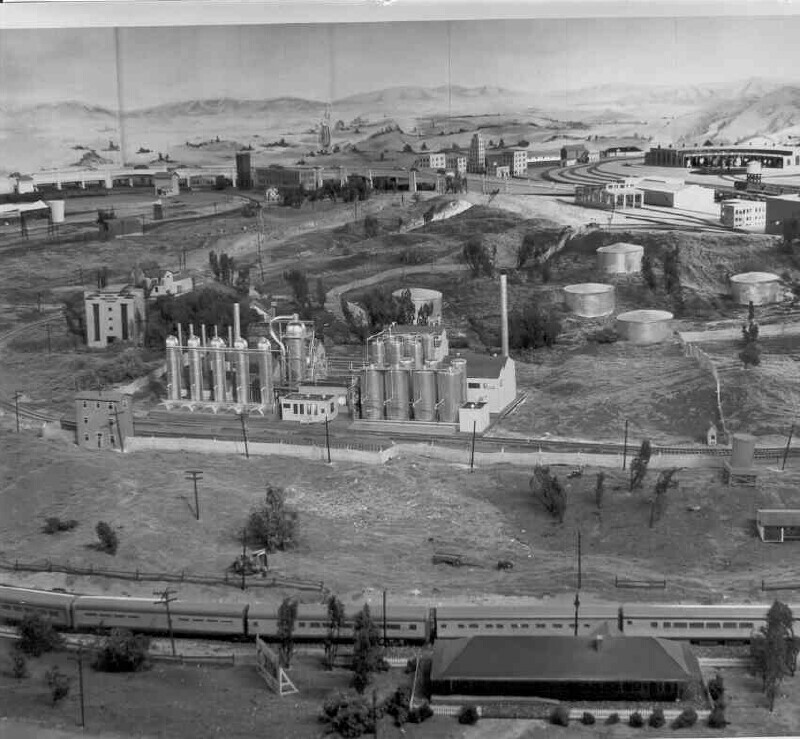 The North end of the building was also constructed years earlier over a tributary of "Temescal Creek" which would cause problems in later years. 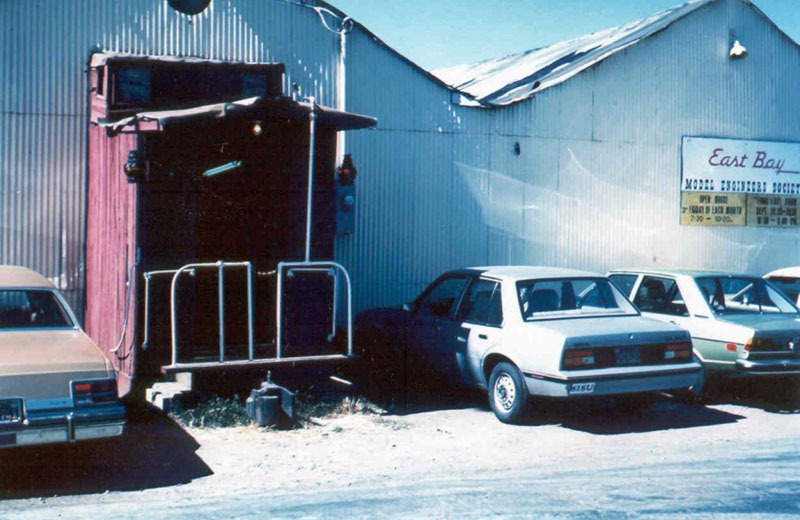 The building was of wood frame construction with corrugated sheet metal on the sides and roof. The roof was coated with black tar to help seal out the elements, which as we shall see in later years, did NOT work that well. The primary building entrance was a mock-up of one half of a full size railroad caboose, complete with marker lanterns and coupler... It was located on the Halleck Street side of the building. Untold thousands of visitors as well as members walked thru the portals of that caboose for some forty-four years. In the Winter months, the inside of that building would get terribly COLD and you really had to bundle up to stay comfortable.. In the Summer months, the opposite was true. That building would get so HOT, you felt like you were going to melt away! These various weather extremes caused additional problems to the club layouts. Let's go back in time several years... 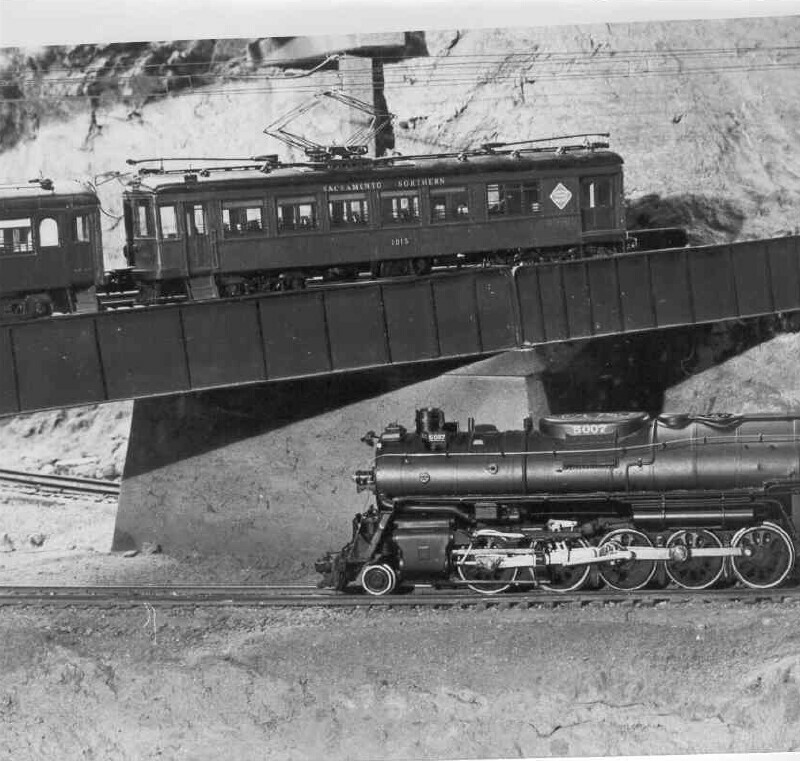 Your Father has decided to take you to see the "Fall Show" of the Eastbay Model Engineers Society in Emeryville. You decide to drive North on Wood Street from the SP 16th Street station and when you come around the corner onto Beach Street, you are greeted by the view in the next series of photos !! After your Dad parks the family car, you are excited as all get out and are escorted to a "Red Caboose" jutting out from the Halleck Street side of the building. Your Father pays the required entrance fees--- $ 1.00 for an Adult-- 50-cents for a Child (under 12) ... You rush inside with excitement and anticipation-- at the end of three or four hours-- you will NEVER want to leave the place. A gigantic golden sign that says " SANTA FE" greets you upon entering the building.. You are now facing the gigantic O-scale layout, the "Santa Fe Western", in a 130x75 foot space... You can't believe your eyes !! Is this really happening ?? 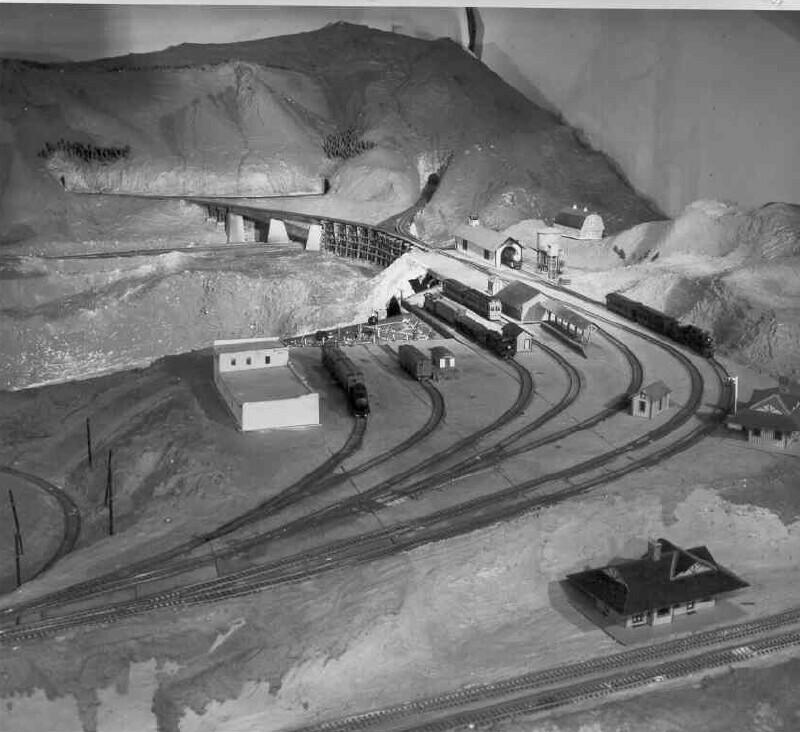 You walk on thru the clubroom to the HO- scale "Santa Fe Central" layout in the rear of the building. 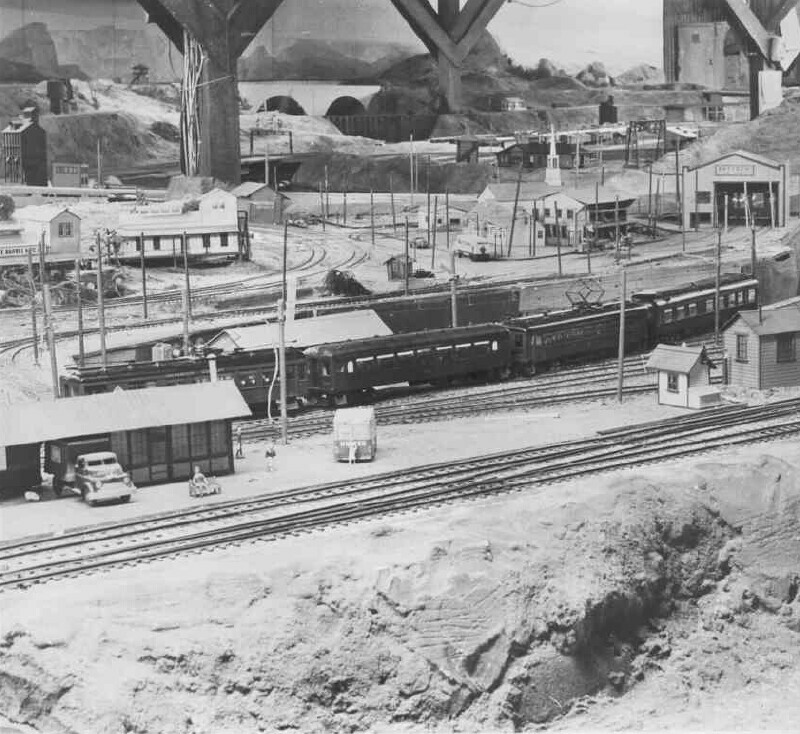 This ambitious layout, probably the country�s largest at the time, was started in 1940 within a 90 x 36 foot room. 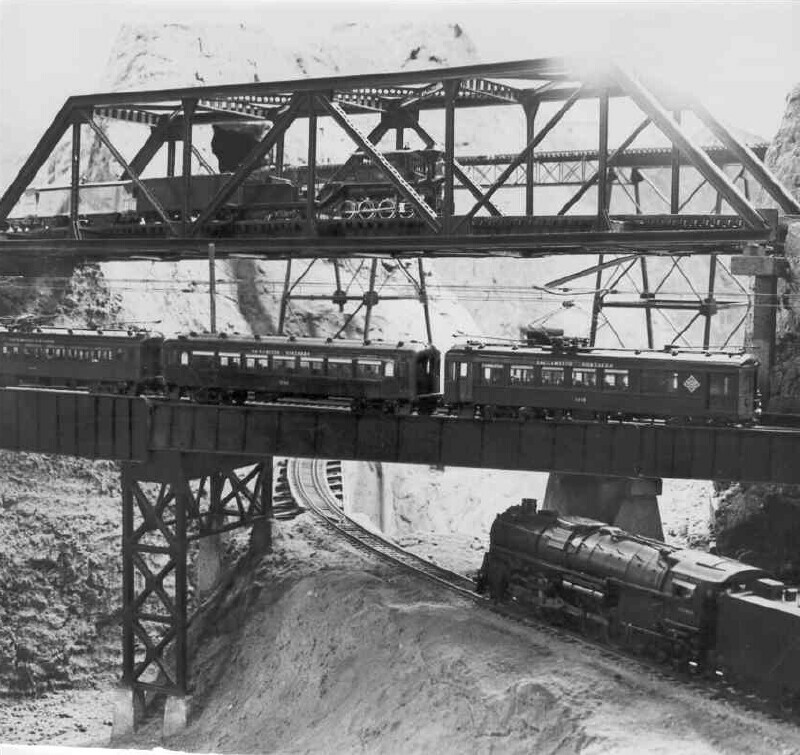 When �initially completed� it had some 2000 feet of trackage, later 2500, of which 310 feet was double track mainline, some 155 feet of that being triple track for passing. One straight section of mainline was 68 feet. 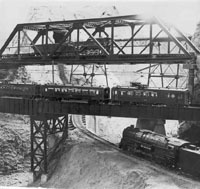 The Mountain Division contained 250 feet of track, only one-third of which could be seen, the remaining trackage being concealed behind scenery. The maximum mountain grade was two per cent. 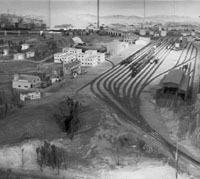 Freight classification yards (North Oakland) could hold over 200 cars. Its engine terminal included a 17-stall roundhouse, and the turntable could accommodate a scale 130 foot engine. 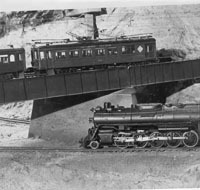 Power was transmitted to the turntable by the wheels running on the pit rail. 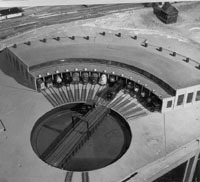 Oakland, the main passenger terminal, had 7 tracks� 2 incoming, 4 outgoing and 1 engine return track. Diesel trains could be Y�d around without leaving the passenger yards. There were also five (5) other yards. 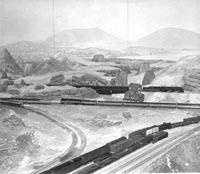 Bakersfield had 6 tracks, 4 leads to the main line and 1 to the Mountain Division. Cajon had 5 tracks, two leads to the Mountain Division, and 1 lead to Daggett. �West Poke Chop� had 10 tracks and one track up an impossible 5 per cent grade to Daggett. Eighteen inch radius curves prevailed over this little division. 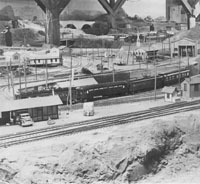 Daggett had tracks with interchange facilities to the HO scale trolley line, East Bay Traction Co. 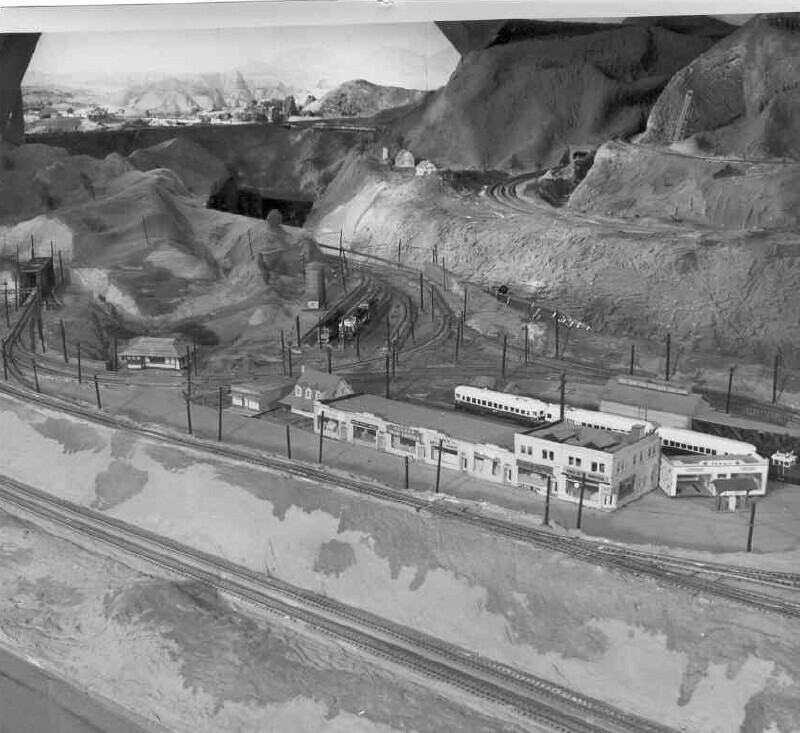 The trolley yard had 4 tracks and all power distribution was through the 32- gauge overhead wire as per the prototype. 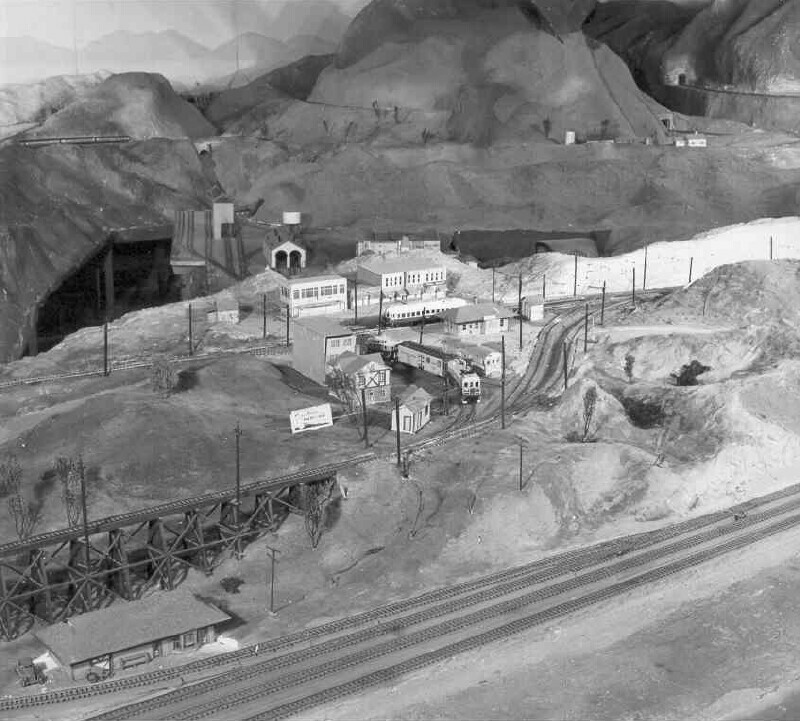 Scenery consisted of over one ton of plaster, all on a screen wire base. 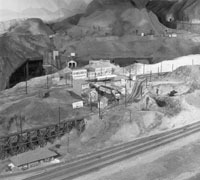 There were nine tunnels and twenty bridges and overpasses. There were 136 switches, 50 of those were on the mainline and were electrically controlled by the dispatcher from the CTC board.. Power to the track and switches was supplied by a 27-volt generator divided into two 13.5 volt circuits operating thru a three-wire system. Storage batteries were used across the line to give smooth power as well as additional amperes when needed. All indicating lights were supplied by a twelve volt transformer. Approximately 62,725 feet of wire was hidden under the benchwork.. (More than 11-miles) 150 relays were used in the CTC system. The position of each train was indicated on the master engineer�s board and the dispatcher�s CTC panel. 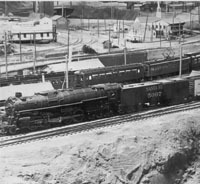 Electrical connections were arranged so that indication lights would not function unless a train was actually in a block. There were seven cabs. 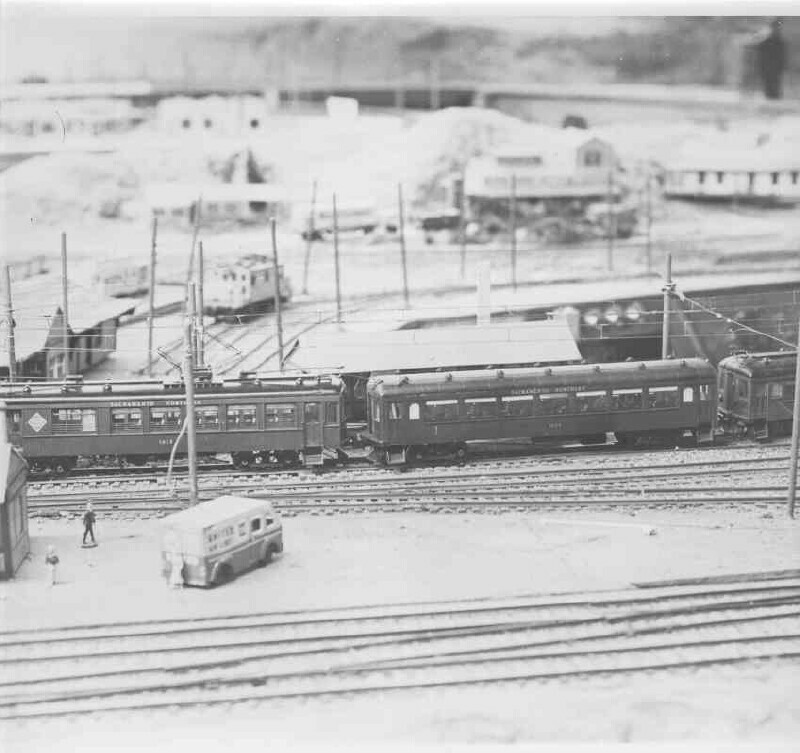 Engineers in those cabs could operate their respective trains over the entire layout except in the yards. Communication was maintained between the dispatcher and the entire personnel operating the layout through a six station intercommunicating set. All stations could talk back to the Dispatcher. 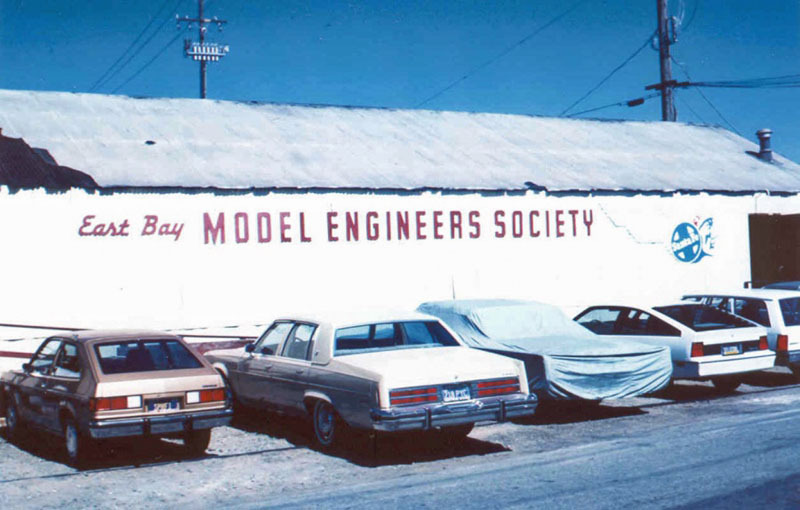 During the last several years of its existence at the Emeryville location, the NAMES of some of the Yards were changed.